Happy Christmas all. 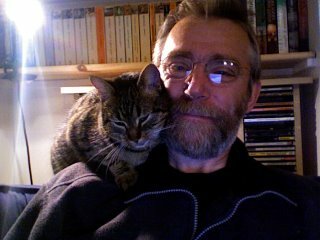 Would have been Happy Solstice but one of our cats died that day. Anyhoo. Back to this image from the Japanese paper of the last post, open circles are without metformin, filled circles are the same people taking metformin 500mg tid. If we initially look at the fasting values for the RQ we see 0.8 without medication and 0.77 under metformin, so adding in metformin gives an increase in fat oxidation. A very simple explanation for this is that, via metformin induced blockade of mitochondrial glycerol 3 phosphate dehydrogenase (mtG3Pdh), there is less glycolysis derived electron input at the CoQ couple, so it is less reduced and so there is less tendency for reverse electron transport through complex I. This generates less of the superoxide necessary to trigger the initiation of insulin signalling. The cells then behave as if there is even less insulin present than the 25pmol/l measured, so free fatty acids are more available for oxidation due to this reduced insulin signalling. The simple concept is of metformin as "LC eating in a pill". The fed state is altogether different and diametrically opposite. Insulin levels are between 100 and 200pmol/l. 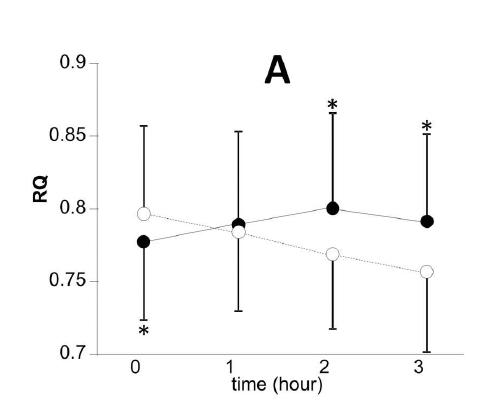 Under these conditions the RQ is significantly higher under metformin, an RQ of 0.8 vs the non medicated RQ of 0.76, present at the two hour mark with the differential maintained at three hours. Under these conditions metformin is facilitating the oxidation of glucose while there are calories in excess of immediate needs available, many of them from the butter in the cookies. If we consider that blockade of mtG3Pdh should blunt insulin signalling we have a paradox that by one hour after a meal insulin signalling appears to have been facilitated and at hours two and three this reaches statistical (and probably biological) significance. So how can the one drug have opposite effects under differing conditions? The initial conclusion here was that metformin only facilitates blood glucose reduction in the presence of insulin. Metformin should, theoretically, blunt the action of insulin. But if we consider that at high levels of insulin the function of that insulin is to limit its own action, I think it would be much better viewed as metformin blunts insulin induced insulin resistance. Insulin was bolused iv at 90 minutes. It will have given a massively supra-physiological plasma level. Insulin induced insulin resistance in the insulin treated group appears to be absent at 30 minutes (ie 120 minutes on the graph), to have started at 60 minutes (150 minutes on the graph) and to have gotten p to below 0.05 at 90 minutes (180 minutes on the graph). 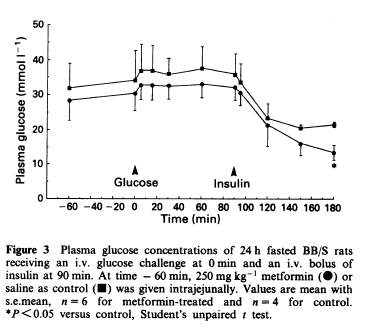 Of course under an-insulinaemic conditions there is no insulin signalling to facilitate or block, hence the zero to 90 minutes on the graph where metformin has no effect on blood glucose before insulin was bolused. Insulin is an effective inducer of insulin resistance. Working on the basis that insulin induced insulin resistance is triggered by "excessive" (ie physiologically appropriate to limit nutrient ingress under high calorie availability conditions) levels of superoxide generation then blockade of mtG3Pdh will reduce this "excessive" level of superoxide so defer the onset of insulin induced insulin resistance. This will allow on going utilisation of glucose post meal in the Japanese paper and post insulin bolus in the rodent study. You just have to wonder whether metformin reduces hunger by blunting insulin signalling at adipocytes, so supplying more calories for the brain to sense or by facilitating the action of insulin within the brain so higher levels of insulin derived from eating absolute crap no longer induce CNS insulin resistance. Maybe both. "Post-prandial plasma lactate concentration was significantly increased after the metformin treatment in both healthy subjects and diabetic patients". Note that the effect was only present under high insulin levels post prandially when the normal physiological response is to shut down excess calorie ingress by inducing insulin resistance. Prevent this response and the calories enter cells as un-needed glucose and exit as "waste" lactate, minimising ATP generation. Merry Christmas Peter - this might make sense to you - it connects mitochondrial ROS generation with HDL cholesterol. "ABCA1 not only transports cholesterol out of cells, but also transports reactive oxygen species out of human artery wall cells (endothelial and smooth muscle cells) that are required for human artery wall cells to oxidize LDL. The number, shape, size, and cellular distribution of mitochondria may be critical to the formation and export of reactive oxygen species and LXR ligands such as 27-hydroxycholesterol from mitochondria. " Clear as mud to me, is cholesterol here part of an antioxidant system, or a ROS signalling system, or both? So will increases in mitochondrial density on keto influence lipoprotein counts? It looks like that to me. Season's greetings Peter. I wonder if there is any complication on this data from the clearance rate? Metformin has a half-life in plasma of 6 hours for healthy kidneys, is supposed to be undetectable in urine from one dose after 24h and interestingly it exits unchanged. I remember trying to calculate what the effective level vs time would be for two or three doses a day and a 12 hour gap, quite tricky with a jagged graph which slowly ramps up over time. I suppose there is a pharmacist's algorithm for working out this sort of thing? I've started looking at the paper, George, but it looks like it needs some sit-down time! Can someone injecting insulin use metformin to minimize the insulin resistance mentioned in the article on type 1 diabetes in rodents? Yes, Richard Bernstein talks about this in his book. However he does comment that while metformin alone is essentially free of hypoglycaemia risk its combination with exogenous insulin or insulin secretagogues carries the risk of hypoglycaemia. Looking at the rodent graph I'd say the risk is very real. Insulin induced insulin resistance is far from the body being stupid. It happens because it is a useful trait in the post prandial period in normal organisms. Happy Christmas and New Years now Peter! Just wondering, do veterinarians give Metformin to cats and dogs? PS, I once ran a glucose curve on a dog which went from 4.5mmol/l up to about 7mmol/l post prandially and dropped to 4.5mmol/l by 12h. A colleague looked at it and, bless her, commented "your glucose curve is upside down". 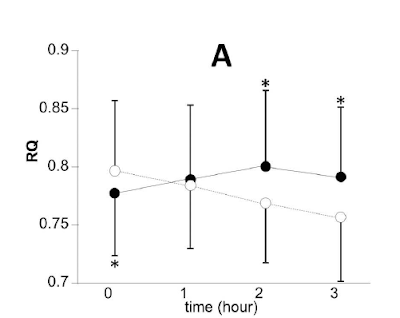 A drop from 20mmol/l to 7mmol/l and back to 20mmol/l by 12h is more like "good" control. OK, maybe 15mmol/l as the base line is "good", 20mmol/l would be "reasonable". Grrrrrrrrr. I was just thinking of writing some thoughts on the TRAC2 paper you mentioned and I've lost access to the editorial. I have the full text of the paper it's talking about but the editorial is what puts it in to context. Do you have a pdf copy? Thanks raphi. BTW did you get the same RQs as I did???? Oh right I forgot to confirm hahaha! The guess I ventured is "i don't think it'll skew towards carbs/~1. the aforementioned RQs were for ExoKetones. EndoKetones (from fat) make no CO2 but use up O2, dragging the RQ to 0. and during exercise we're in a non-steady state...but the crossover point in keto-adapted athletes is pretty skewed to the right (unlike that classical symmetric X sitting dead centre in the graph) which shows a relative delay in the RQ creeping towards 1 with increasing intensity"
Does anyone know of research into which fatty acids are preferred by muscle? For example, will linoleic acid and lauric acid by taken up by and consumed by muscle at much the same rate if equally available? This seems a bloody hard thing to test for. A related question is whether the mix of FFAs released from storage in adipose is the same as that from lipolysis of lipoprotein TGs. Or indeed whether there are preferences for which FAs go to adipose vs muscle. i don't know the answers to either question, but I do think that the beyond the membrane signaling role of a given level of oxidized PUFAs, I'd expect those PUFAs to be disposed of. Now whether or not that means metabolized, stored away or detoxified by the liver I do not know..
George, I spent quite a lot of time looking at the mix of FFAs released from adipocytes under fasting. It was very frustrating, just occasionally you'd pick up snippets to suggest FFAs under fasting were more saturated than those sooner post absorption. My biases drive me to expect highly saturated fats should allow much better physiological insulin resistance, any confirmation gladly accepted! In the energy model of cholesterol LDL is just what's left over once TGs are removed from VLDL and other ApoB particles manufactured to supply them to peripheral tissues (which muscle can stand in for). Now, some fatty acids raise LDL (and HDL, but we'll ignore that except to say that the connection of ApoA1 and hepatic lipase makes HDL a "fat burning" fellow too) more than others. C12>C14>C16>c18 for SFAs. MCTs - C6-C10 - don't raise LDL. PUFA's dont. C12 is metabolised faster than C18. There is less metabolic resistance to its beta-oxidation, because it has less propensity to be elongated, desaturated or stored compared with C16, C18. So the LDL effect (or after-effect) corresponds to peripheral fuel use. Now, MCTs - converted to ketones in liver - no need for much ApoB transport out. LA and ALA - medium half-life, but a large % of these is interconverted to other lipids such as cholesteryl esters in liver. Much energy loss and less need for ApoB transport out, so subtracted from LDL 9after) effect of fat. Seems to be stored in adipose at a high rate even so, maybe not a fantastic muscle fuel. C18:1 maybe like C18 with shorter half-life, a slightly higher affinity for adipose, some recycling waste in liver, similar effects on LDL. Suppose I eat 2 oz of cheese neat perhaps with 1 oz cream but no carbs. Then my insulin rises for about 3 hours along with glucagon to maintain normoglycemia. Now does it mean that lipolysis is shut-down for the duration insulin is high?